Last night, I watched with horror as the police force attacked the people of Istanbul. I watched late into the night, not sure of who the best sources were ... but I watched, hoping the people would prevail against yet another government who has stopped consulting its people. I imagine there is a lot of 'information' going out into the world today. Each with its own spin, as newspapers and governments decide how this story will be spun ... how will the story of Turkey best serve their interests. As for me, I know what I know based on the fact of having spent two years living there. And yes, it was a while ago now but the basic nature of the people, the culture ... it won't have changed dramatically. The people of Turkey are some of the kindest and most hospitable in the world. They have a humour I recognise from New Zealand. They love to tease, to mock gently but kind. I have never met kinder. I spent a couple of weeks on crutches while there and it became usual to have strangers say, Geçmiş olsun, as they passed me in the street. It translates as get well soon. And the ankle injury 'incident' was a story in itself. I was at a job interview and rolled my ankle as I was leaving. Mortified, I made myself hobble over to a taxi. Sitting there in the back, not sure of where I would take my rapidly swelling ankle, the taxi driver asked me to give him any friend's phone number, called Ozgur, picked her up, took us both to hospital, and refused any payment. I was in his taxi for an hour. This was commonplace, in terms of my experience of Turks there. Another day saw me arrive at a little shop run by two brothers. We 'knew' each other a little, as I was a regular customer. That day I was coughing up my lungs and, of course, I left with a bag full of herbs they gifted me, explaining that I needed to brew and drink them. The same happened when my friend Kagan, and his wife, took me home to her parents in Ankara for Seker Bayram, otherwise known as the Sugar Festival. That too is a story but too long for here. I was coughing again, I struggled with spectacular laryngitis in those years immediately after mother died. Another special drink was made, honey-based and full of all kinds of things, whipped up for me by the very kind head of the household. The kindness of the vast majority of the people I met there left me speechless sometimes. I adored the parents of my lovely friend Beste. She married Jason, another good friend and colleague of mine, and they took me to her parents home often enough for me to wish that I could always live over there on the Asian-side of Istanbul with that special family. Her father insisted on meeting Gert before I flew off with him ... explaining that, as I had no family there, they would check this guy out. They approved but her mum did tell me I was welcome back there if things didn't work out over in Belgium. All this despite the fact that she wasn't that much older than me. The food was incredible. I miss it still. No place else (that I've been) does food like Turkey. I never had one favourite food, there were many ... too many to name. And open, the people were so open. Europe came as a huge shock and I suffered during my first lonely months here in Belgium. After life in a living, breathing, hustling-bustling beautiful-crazy city like Istanbul, Belgium seemed very quiet and kind of cold. There's was no welcome in the cafes or the hairdresser ... although I am finding those spaces. It just takes much longer. I was nuisance and my friendliness was just a wee bit too much. I had to reset my behaviour over those months after I moved. 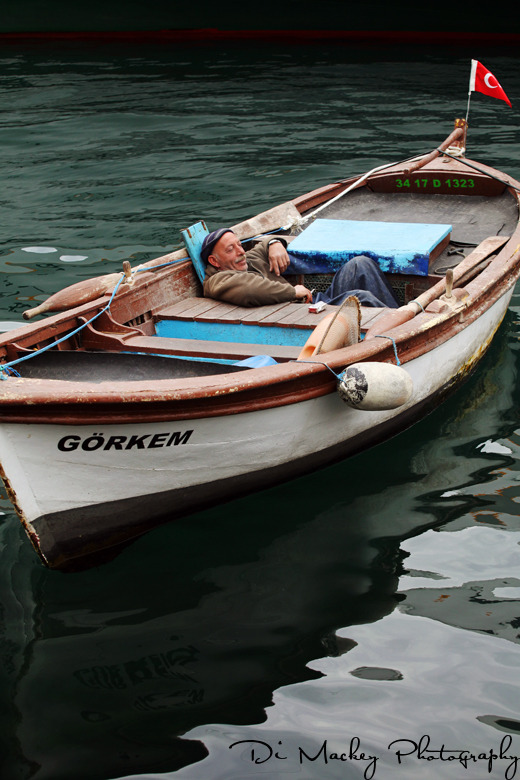 I returned to Istanbul in 2008, staying with treasured friends Lisen and Yakup, capturing the city with my camera as they took us all over the place ... as we four worked on a huge photography project that we must complete one day. I returned home with thousands of photographs and a hectic schedule. The woman in the photograph below. I knew her for a very short time. 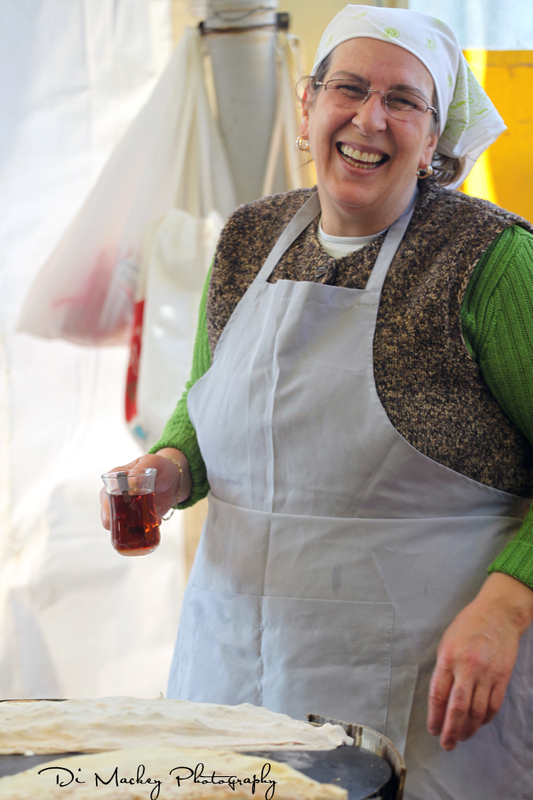 I ate the delicious gözleme she was selling at the organic market there in Istanbul. And we talked, via Yakup, and she said yes to the photographs. She and her friends ... they just opened up for me. Whatever comes out of Istanbul in the days and weeks ahead, however it is spun, just know that the Turks have big hearts. Enormous hearts. As a society in general, I think I can state that they value family and love children ... so much. Sure there the usual problems associated with a 'loving' family but the love is there anyway. When the prime minister appealed to parents to take their children home from the protest, the mothers arrived and formed a human chain around the park they are protesting in ... a chain between their children and the police. Last night as the police brutally attacked those protestors, the people of Istanbul began marching towards the heart of the protest, from suburbs all over the city. Peaceful everyday people, marching into a policeforce that seems out of control, or under the control of a prime minister out of control. I almost cried as they marched in the small hours of the morning. Yes, if you are Turkish and in your 20s, your mother's friend might read your coffee grounds, using it as an excuse to give you a hard time about the boyfriend they don't approve of ... but we all laughed when they did that. One night, I remember falling asleep to the sound of a small group of retired officers wives, talking and laughing as they played cards in the room next door to me. I was a guest, snuggled in amongst yet another Turkish family and it felt so very good to be there. The mother-in-law of a friend wanted to keep me and immerse me in Turkish until I was fluent. Her son had taken to calling me a 'winter woman' ... the woman you have for winter, when the weather is cold. The teasing, oh the teasing. They thought they were hilarious, making me blush like that. The taxi-drivers, the people in the shops, the cafe staff, the hairdressers. I left with a million stories I hold close to my heart. I treasure the friendship of the students I still know from those days, so proud of those like Ege, who now studies in Paris. Don't just believe one story of the political situation in Turkey. Visit sources like Erkan Saka if you want to know more. You can read about him over here. Find your own sources, but don't judge without searching. The people of Turkey deserve no less.